Kopdil is a drug that is used for treating the male pattern baldness and hair loss in women. It is the only active ingredient approved by FDA used as a hair growth stimulate. 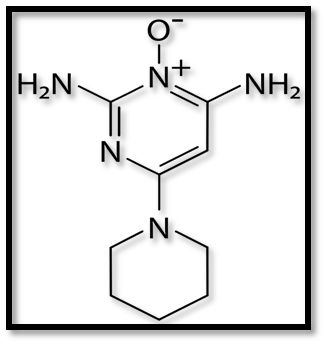 FDA approved, COFEPRIS GMP certified, CEP certified molecule. The limitation of “Kopdil” is that it is practically insoluble in water which limits its use in the formulations having relatively low proportion of water and containing high concentrations of alcohol or poly alcohol are in general not well tolerated. Alcohol present in topical preparations may dry the scalp, resulting in dandruff. Kumar Organic Products Limited has come out with novel water soluble salts prepared by hitherto unknown. Combinations of hair growth stimulants Kopdil (Minoxidil) and a multifunctional compound which cannot only prevent hair loss but can stimulate new hair growth also. Kopexil increases the volume of hair in the growth stage by working on the deep structure of the roots. It rejuvenates the hair roots so that healthy hair growth can persist. The perifollicular fibrosis is a condition in which collagen around the roots becomes rigid, tightens and pushes the hair out. Kopexil helps in softening of collagen. Kopexil is used in hair cosmetics to combat hair loss due to premature exhaustion of the hair root. Activation of hair follicles and no miniaturization of follicles. Increases blood flow to the root and strengthens hair. Anchoring with the maximum efficacy. Reverses the hair loss process and helps regrowth. Hair Conditioners, Hair Serum, Hair Shampoo, Hair Lotion, Hair Cream, Hair Spray, Eye Liner and Mascara. Kumar Organic Products Limited, has come out with novel water soluble salts hair growth actives prepared by the combination of hair growth stimulants Kopexil (2,4-Diamino pyrimidine-3-oxide) and a multifunctional compound which can prevent hair loss and also accelerates the hair growth. Kopyrrol recovers weak follicle cells by supplying the nutrition that hair needs for growth and increases the volume of hair in growth stage. Through the bloodstream Kopyrrol works at the level of hair root which is responsible for healthy scalp and beautiful hair. Kopyrrol is used in hair cosmetics to combat hair loss due to premature exhaustion of hair root. Kopyrrol has not been approved by the FDA. Kopyrrol is allowed in Europe and USA for Personal Care application. Kopyrrol is allowed in Japan for select product category. Kopyrrol can be used in most of the Asian countries. The limitation of “Kopyrrol” is that it is practically insoluble in water which limits its use in the formulations having relatively low proportion of water and containing high concentrations of alcohol or poly alcohol are in general not well tolerated. Alcohol present in topical preparations may dry the scalp, resulting in dandruff. Kumar Organic Products Limited has come out with novel water soluble salts prepared by hitherto unknown. Combinations of hair growth stimulants Kopyrrol and a multifunctional compound which cannot only prevent hair loss but can stimulate new hair growth also. Kopyrrol as the effect of promoting the proliferation of dermal papillae cells. It is an active ingredient, and thus inhibits general male-pattern or female pattern hair loss and promotes hair growth. 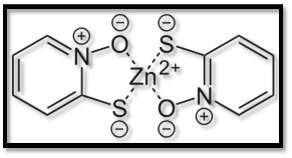 Zinc pyrithione is a coordination complex of zinc. It has fungistatic and bacteriostatic properties and is used in the treatment of seborrhoeic dermatitis. 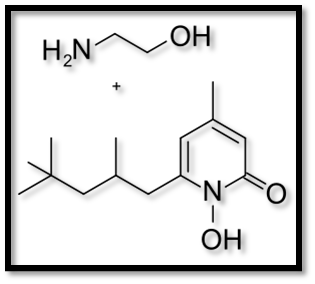 ZINC PYRITHIONE yields a soluble portion of Zinc Pyrithione molecules, which penetrate the fungal cell membrane (green). Piroctone Olamine is known for its bacteriostatic and fungistatic properties specifically working against Pityrosporum ovale, which lives on the skin and is associated with dandruff and other manifestations of flaking on the face and scalp. It is often used in shampoo as a replacement of commonly used Zinc Pyrithione. It has been used over 30 years in the personal care formulations and also used as preservative and thickening agent. Hair shedding and hair thinning have been reported to be affected by dandruff and seborrheic dermatitis. In a comparative clinical study, it was demonstrated that Piroctone Olamine outperformed Ketoconazole and Zinc Pyrithione based shampoo in its ability to increase hair shaft diameter inn androgenic alopecia. Piroctone Olamine also reduced sebum production. 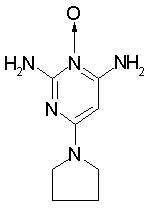 Piroctone Olamine is the ethanolamine salt of the hydroxamic acid derivatve of piroctone. Solubility Freely soluble in 10% ethanol. Slightly soluble in water. As a preservative and thickening agent in cosmetic preparations. In general, hair care formulations and used against seborrheic dermatitis. Ciclopirox Olamine is a synthetic broad spectrum antifungal agent that inhibits the growth of pathogenic dermatophytes, yeasts and malassezia furfur. 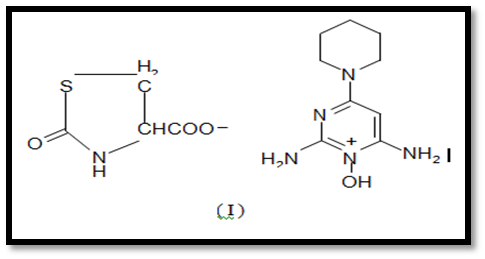 Ciclopirox Olamine exhibits fungicidal activity in-vitro against isolates of Trichopython rubrum, Trichophyton mentagrophytes, Epidermophyton floccosum, Microsporum canis and Candida albicans. 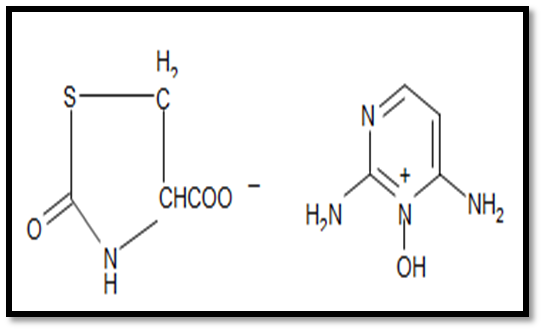 It is presumed that Ciclopirox Olamine mediated growth inhibition or death of fungal cells is primarily caused by in-vitro cellular depletion of some essential substrates or ions and that such effects are brought about through blockage of their uptake from the medium. It also has anti-inflammatory activity. 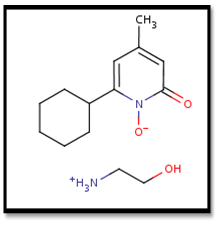 The FDA has approved this compound for use in the US in Dec 1999. Cream 0.77%– Treatment of tinea pedis (Athelete’s foot), Tinea Cruris (Jock Itch), Tinea Corporis (Ringworm), Cutaneous Candidiasis and Tinea Versicolor (Pityriasis). Gel 0.77%– Treatment of Tinea pedis (Athelete’s foot), Tinea Corporis (Ringworm), Seborrheic Dermatitis of the scalp. Lacquer 8%– Topical treatment of mild to moderate onychomycocis of the fingernails and toenails due to Trichophyton rubrum. Shampoo 1% – Treatment of Seborrheic Dermatitis, formation of scales and flakes on the scalp. Kopcolate-A is widely used in hair industry. It acts as a permanent waving and hair straightening formulation for the hair treatment. Kopcolate-A also may be used in permanent hair colors, levels upto 0.25% as a stabilizers against oxidization. around a curling rod and sprinkled with an oxidizing solution containing hydrogen peroxide. 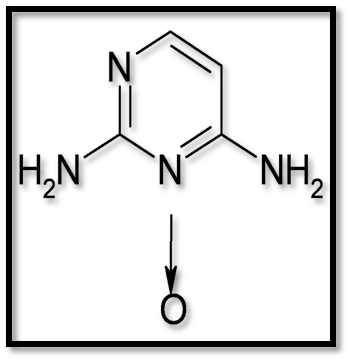 The disulfide bonds are reformed and the hair comes off the rod with a curl. 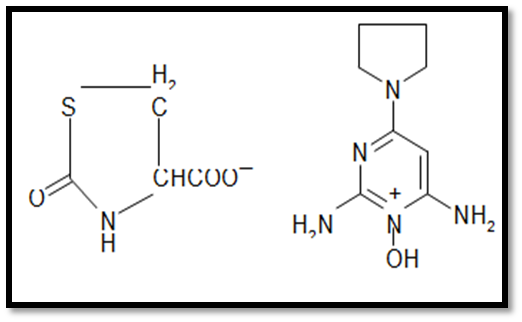 products are typically needed before hydroxide products are used, while they are not needed for thioglycolate products.